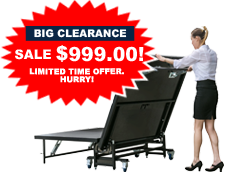 Free shipping on most orders over $2499.00 please call in orders of smaller value. 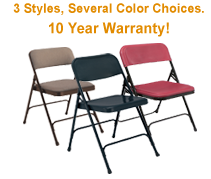 Our friendly staging experts are here to help. 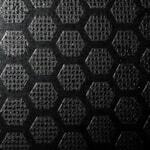 Whether you have simple question or need help designing a complex stage. 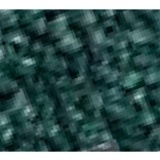 We are here to assist you. 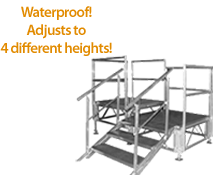 Purchasing a stage system can seem pretty confusing, but we are here to guide you every step of the way. 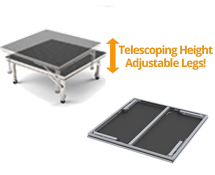 Learn more about portable staging basics here. 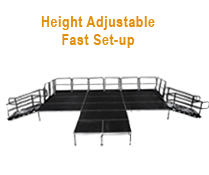 We carry all the major brands of staging such as Intellistage, Midwest Folding , All-Terrain, Pro-Stage, Staging 101, Signature Fencing Alpha-Deck, Express-Deck staging and National Public Seating staging to name a few. 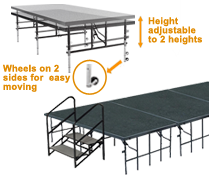 Whether you are looking for portable stages, mobile stages with wheels, modular stages, aluminum stages, height-adjustable stages, or outdoor stages, you can be sure you've come to the right place! 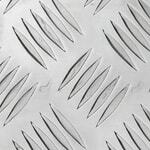 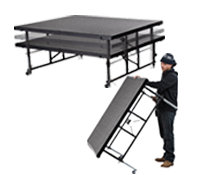 We also carry all the accessories you could possibly need for your stage such as stage guardrails, stage ramps, stage skirts, stage steps, backdrops, Truss and Roof systems and transportation/storage systems. 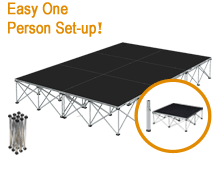 We only specialize in selling portable stages, and because of this, our friendly staging experts are the best in the business! 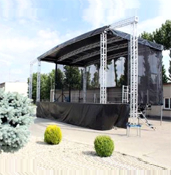 We have years of experience assisting churches, schools, government organizations, the military, and many business organizations in finding the perfect stage system for their needs and budget. 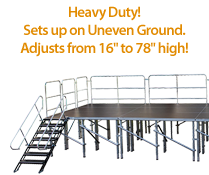 We take the hassle out of purchasing your stage and do all the work for you. 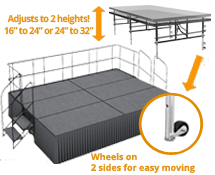 We listen to your wish list and help you design the perfect stage system for your needs and budget. 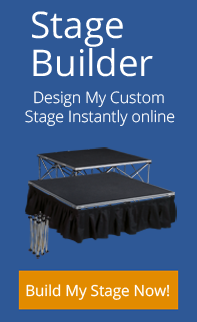 All our stage designs and expert advice is always fast and free! 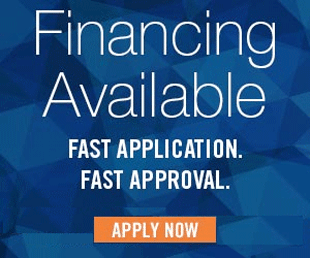 Simply call us at 877-884-3426 or email us at orders@thestagedepot.com, and we will be more than happy to assist you.